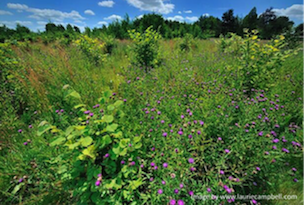 Three Hagges Wood-Meadow is a creation project which maximises biodiversity benefits by establishing native trees within a ground flora of fine meadow grasses and perennials. Wood-meadows have been, and are still in many places traditionally managed throughout Europe, which is the prime conservation focus of the Trust. The aims of the Trust are to provide a high-diversity wood-meadow which serves nature conservation and is a community woodland experience for the public. It also serves as an evidence-based demonstration of what can be achieved for others wishing to redress the large-scale losses of biodiversity that have taken place over the past 50 years. Invertebrate (insects, molluscs, arachnids, crustaceans) from sub-habitats within the developing wood-meadow ecosystem created de novo. Absences are not recorded. Vertebrates (small mammals) recorded from fifty Longworth traps placed in a variety of habitats across the site, baited with wheat, peanuts, sunflower seeds, carrots and blowfly pupae, with a ball of hay for bedding. All vascular plant species and trees recorded at THWM on 10th May 2018: full site survey of species present.